Google pushes for driverless cars | What Car? Google is developing technology for driverless cars and is pushing lawmakers to make the cars legal on public roads so it can test the technology. The search engine giant has already racked up more than 140,000 miles in a fleet of automated Toyota Prius and Audi TT cars in the US using its latest location technology. These mules included a successful drive down Lombard Street in San Francisco one of America's steepest and curviest roads. The search engine giant is now lobbying for the cars to be legalised in Nevada. Nevada State Legislature will vote this month to decide the future of a bill to legalise the use of self-driving cars in its state. Google is also promoting an additional bill that would allow 'drivers' to text while behind the wheel. Google lobbyist David Goldwater says that self-driving cars are safer and more fuel-efficient, while promoting economic development. Modifications to the cars include the addition of a rotating sensor on the roof that generates a 3D map of the surrounding area, a position estimator that accurately locates the car on a digital map, three radar sensors and a video camera. 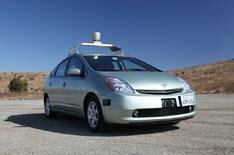 Google claims that the use of robotic cars will result in quieter and safer roads. During testing, the fleet has been involved in only one accident: a Prius was rear-ended at a traffic light.